​IMPORTANT COMMENT ABOUT RIGHT DIVISION! There is something I want to say about RD (Right Division). ​There are some RIGHT DIVIDERS out preaching The Gospel of Christ, placing DOCTRINE and RIGHT DIVISION over CHARITY. A Teacher of The Gospel of Christ without CHARITY gives the feeling of being farther away from God than being closer by their ‘perspective’. ​There’s a subtle pride that RIGHT DIVIDERS can fall into, that I think is of the devil. In that, the way they teach brings about a darkness, a confusion, and a weight. Remember people, JESUS SAVES, and becoming modern day Scribes and Pharisees does not. Scriptures lead us, and point us to JESUS CHRIST! Both of these topics are what snare and snag some RIGHT DIVIDERS. They ‘reason’ God out of our lives unknowingly, BY NOT HAVING GOD'S CHARITY. We believe when we hear the Word of God, but we receive, believe, and trust CHRIST AS OUR SAVIOUR over all else. That’s were the song above by Johnny Cash and written by Jimmie Davis comes in! ​God can use what or whoever He wants to bring us to His Son! That in and of itself should give us Joy! May this be for each of us as Brothers and Sisters in Christ! There are to many so called RIGHT DIVIDERS out there that teach without CHARITY, thus causing people they teach to BITE AND DEVOUR one another. If a Bible Teacher becomes narrow minded, THE CHARITY of God, that God wants us to know will be missing, and we loose our rest in HIS assurance. God’s Word’s is the Living Christ and not just words on a page! Salvation Is By God's Grace ALONE! Good Works Cannot Save You! "Salvation Is By God's Grace ALONE! Good Works Cannot Save You!" JESUS CHRIST DIED FOR OUR SINS! WAS BURIED! ​AND ROSE FROM THE DEAD BY THE POWER OF GOD! GOD'S GOSPEL TRACT UNTO SALVATION FROM HELL! READ FROM A KING JAMES HOLY BIBLE! ROMANS CHAPTERS 1 THRU 4! "TRUST IN WHAT CHRIST DID FOR YOU!" BELIEVE IN JESUS! HAVE FAITH IN HIS BLOOD! BE FULLY PERSUADED! "God Wants You To Be Saved From Hell!" The Most Important Thing A Christian Should Know! "The Most Important Thing A Christian Should Know!" BELIEVE IN JESUS! HAVE FAITH IN HIS BLOOD! TRUST IN JESUS! BE FULLY PERSUADED! has already accomplished everything necessary for your Soul to be Saved! 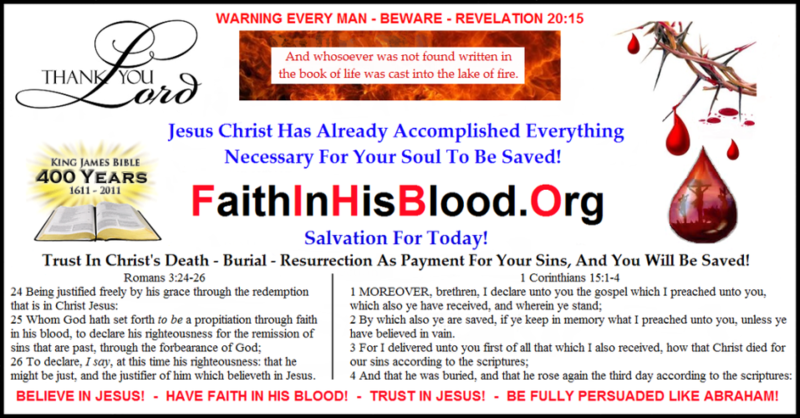 ​TRUST in Christ's Death, Burial, & Resurrection as payment for all your sins! ﻿YOU DON'T PRAY TO BE SAVED! OUR FAITH IN JESUS SAVES US! WATER BAPTISM IS NOT FOR TODAY! A SPIRITUAL BAPTISM IS FOR TODAY! FOR BY GRACE ARE YE SAVED! THROUGH FAITH! AND NOT OF YOURSELVES! IT IS THE GIFT OF GOD!﻿﻿ NOT OF WORKS! LEST ANY MAN SHOULD BOAST! 1. PRAYER IS LABOURING FERVENTLY! 4. PRAYER IS A GOOD WORK! JESUS CHRIST DID IT ALL FOR YOU! DO NOT INSULT GOD! AND TRY TO ADD ANY WORK THAT YOU DID! Example 1: When I was a young Deputy Sheriff, I believed and had faith that my fellow Deputies were in fact certificated Law Enforcement Officers. In an extreme dangerous situation, I could TRUST in 99% of them. Like in all professions, there is always someone that slips through the cracks, where you know they should not be there... In 1% of my fellow Deputies, I could not TRUST IN THEM in an extreme dangerous situation! Example 2: When I was a Captain for American Airlines, I believed and had faith that my Copilots were in fact FAA Certificated Pilots. When flying with a new Copilot, I could not TRUST them to fly a leg into a dangerous weather situation. Flying in all weather conditions safely, takes years of seasoning as a Pilot. A Copilot with years of seasoning, you can TRUST! I BELIEVE IN JESUS, AND HAVE FAITH IN HIS BLOOD, AND TRUST IN HIM 100% THAT HE COMPLETED ALL THE WORK NECESSARY FOR MY SALVATION! AND, I AM FULLY PERSUADED! ALL VERSES FROM THE KING JAMES HOLY BIBLE! After you die do you think you will you go to Heaven or Hell? We all DESERVE to go to HELL because of what we have done WRONG in this life! The "Good News" is that God LOVES us and wants to SAVE US from going to that terrible place called Hell. After we DIE it will be TOO LATE to be saved. 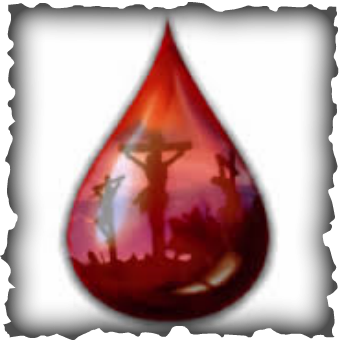 Have faith in the blood of Jesus! Believe in Jesus! "TRUST IN WHAT CHRIST DID FOR YOU!" At this very moment you have the responsibility of making a decision. You can be saved right now! Simply make the decision in your heart to trust completely and exclusively in the blood of the Lord Jesus Christ as the total payment to God for your sins and believe in Jesus! The moment you do, God will forgive you all your sins and save you from spending eternity in the Lake of Fire. He that believeth on the Son hath everlasting life. And be fully persuaded of all the above, as Father Abraham! Johnny Cash, "I Was There When It Happened!" "Johnny Cash - I Was There When It Happened!" "The Power Of Christ On Sin!"